After signing with Lismor in 1996, Coila produced this ground-breaking traditional music feast. This is the long awaited album from this excellent young group from Ayrshire. They have experimented quite successfully with a modernistic approach in their backing and the overall result makes for a very varied and listenable performance. The individual members of the group are all good soloists and some of the slow air playing is of a very high quality as I could expect of Alistair McCulloch and Andrew McGarva on fiddles complemented by their guests, especially Dougie Pincock (pipes, flute and whistle). This is an excellent release from the group who takes its name from their native land of Ayrshire and I look forward to hearing them on their follow up. A little gem of a debut album from this highly talented Ayrshire band. An exciting sound…another very good recording keeping Scottish music very much to the fore, well played and well produced and definitely one for the collection. Coila’s idealistic approach…yields a subtle infusion of differing influences making them unique….the closing pipe reel incorporates both the evocative and the cerebral elements of Coila’s sound in one fell swoop. 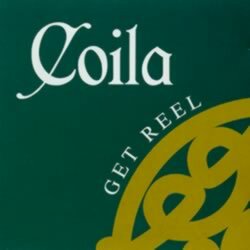 ‘Get Reel’ has Celtic music for mind and body. The ‘Reel’ thing. ….No such problems with Coila’s collection of jigs, reels, airs and waltzes. Just press the play button and fell your soul receive a lift. Coila are four young musicians from Ayrshire…who are joined on this debut album by an array of ‘occasionals’, once again including Dougie Pincock. While the playing is universally impressive, I am particularly struck by the distinctive sound on the tracks that feature drums but no bass. The resulting space allows the twin fiddlers and the accordionist room to stretch themselves – and they don’t need to be asked twice to take up the invitation. An uplifting album and a stunning debut. More please.